You take a much-needed vacation, only to return a week later to find that your pipes froze and burst, and your entire home is flooded. Or perhaps someone left a window open during a rainstorm, and the walls surrounding it are now wet. 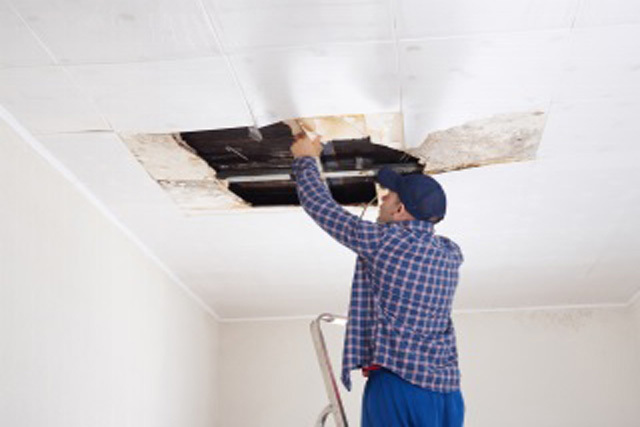 There are any number of reasons that the walls and ceiling of your home could get wet, ranging from minor events that are easy to clean up to major catastrophes that require more in-depth remediation. Regardless of the cause, though, one thing is for certain: When your drywall gets wet, it needs to be cleaned up and possibly repaired — as soon as possible. Drywall, also known as sheetrock or gypsum, is one of the most common building materials in modern homes. Replacing hand applied plaster for walls and ceilings, drywall is made from gypsum and other materials and extruded between two sheets of paper. It’s a fairly durable material, but with one caveat: It needs to stay dry. The only exception is green wall, which is treated with a coating to help resist moisture and designed for use in places where water could be an issue, like bathrooms. Green wall can still become saturated when there is more than the usual amount of water and may need to be repaired if that happens. When drywall gets wet, it can cause dozens of problems. For starters, wet drywall loses its structural integrity, and it can warp or even collapse, especially when it’s used for a ceiling. Wet drywall can also rot and mold, which can present a significant health risk, especially if it is black mold. Unfortunately, major damage can occur in just a matter of days, so it’s important to address wet drywall right away. It’s important to note that just because drywall gets wet doesn’t mean you need to repair or replace it. If the wall gets wet from a spilled glass of water — or if water comes in from a rainstorm — and is wiped up right away, you aren’t going to have any problems. Even a small leak, if addressed right away, won’t irreparably harm drywall. If you catch the problem and fix the leak and get the area dry quickly, the worst that’s likely to happen is a bit of discoloration, which can be covered up with paint. If you notice warping or sagging, though, more intensive repairs are necessary. Typically, if drywall is exposed to a lot of moisture for an extended period (like that week you were away from home on vacation) it’s going to need to be replaced. This doesn’t always mean that the entire sheet needs to be replaced. An experienced Los Angeles drywall repair service can remove damaged sections of the material and replace them, and you won’t even be able to tell where the damage was. However, if the damage is extensive, then the entire piece must be replaced. Again, warping, discoloration and sagging is a dead giveaway that something is wrong, but that doesn’t always show up right away. If you know the wall has gotten wet, touch it with firm pressure. If t crumbles into a chalky powder, then it needs to be replaced. When the drywall is on the ceiling, there are additional signs to look for. Bubbling and sagging are indicative of a serious problem. Bubbling often indicates that water is pooling on the surface above, and it’s only a matter of time before the drywall collapses and you have an even bigger mess. It’s a good idea to check your attic several times a year to catch any leaks before they become a big problem, as even a small, slow leak can lead to big trouble down the road. Although drywall is never used as load-bearing material, and therefore moisture won’t cause structural issues, wet drywall can be a sign that there are problems that could be significant in the future. Not to mention, the unsightly stains and mold (and smell), as well as the health issues that can come from the mold and mildew, make taking care of water issues a priority. Stay aware of water problems in your home, take steps to prevent leaks, and clean up messes when they happen, and you shouldn’t have any serious problems with your drywall. New kitchen appliances are expensive, and as manufacturers add more bits and bobs to them — like fancy doors and smart connectivity — refrigerators, ranges, dishwashers and other appliances are only getting higher in price. If you bought a house that has older appliances, you are probably champing at the bit to replace them with updated models, but if you can’t afford to buy them outright, you should probably wait. First, before you do anything to your appliances, you should consider covering them with home appliance insurance — otherwise known as a home warranty. This protection will help you keep your appliances running while you save up to buy a new set. Even better, if one or more your appliances break down due to regular wear and tear, your warranty provider will help you replace them. There are a few important caveats to this protection. First, you need to be diligent about maintaining your appliances. Though you might not like them much — and you might hope for them to break down sooner — your warranty won’t kick in if there is evidence of improper maintenance. Then, you need to contact your warranty provider to discuss your interest in updating your appliances in any of the following ways. Modifications to appliances might nullify your policy, so it is wise to check before you take any steps. Whenever you are dissatisfied with how something looks in your home, a fresh coat of paint should be your first idea for a fix. However, when it comes to appliances, not just any paint will do. You need a paint that will stick to the current finish of your appliances and will be able to resist the extreme temperatures your appliances often reach. Appliance epoxy paint. You can brush or spray this on like normal paint, and you should find typical appliance colors (i.e. white, black, silver) available. Typical spray paint covered with enamel gloss spray. This is a suitable solution if you want your appliances to be crazy colors that aren’t available in appliance paint. The top coat is mandatory to seal the paint. Automotive paint. 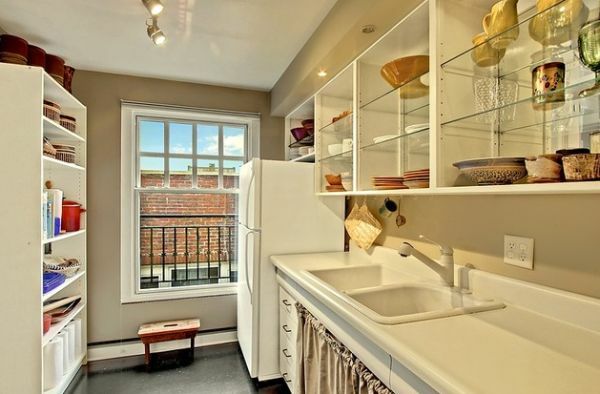 For just a bit more money, you can take your appliances to an automotive paint shop to have them pimp your kitchen set. If paint will invalidate your warranty, there is another option available to you: film. Just as you might peel and stick tints on your car and home windows, you can apply a layer of vinyl to your appliances to give them an instant face-lift. The most common film transforms your white or black appliances into stainless steel, but you can find more intriguing skins if you are willing to take a design risk. 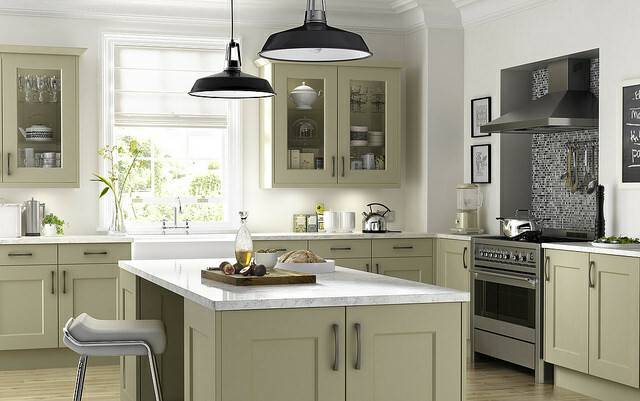 You can even replace the film on your appliances seasonally to refresh the look of your kitchen every few months. However, doing so might seriously cut into your savings for a brand-new set of appliances. Most appliances follow standards for their handles and door fronts, so it isn’t difficult to replace them with updated options. To accomplish this, you might start by contacting the appliance manufacturer, who can provide a list of panels that will fit your current models. 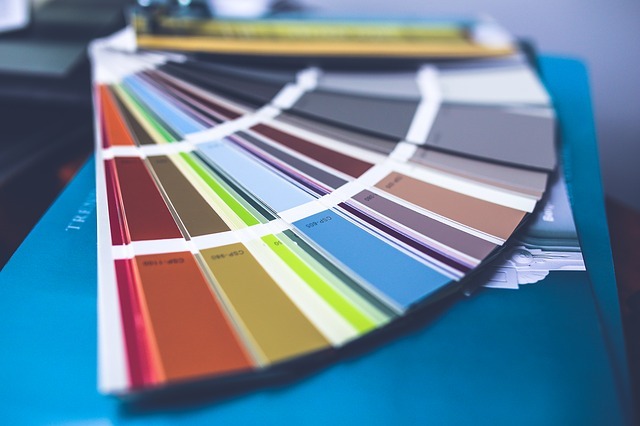 If you are dissatisfied with these options, you can turn to companies that offer custom-order panels, which will provide you exactly what you want in style and color. This is a good option if your appliances are only just outdated and unlikely to stop working within the next few years. It allows you to update the look of your appliances in a professional manner without affecting how they function. 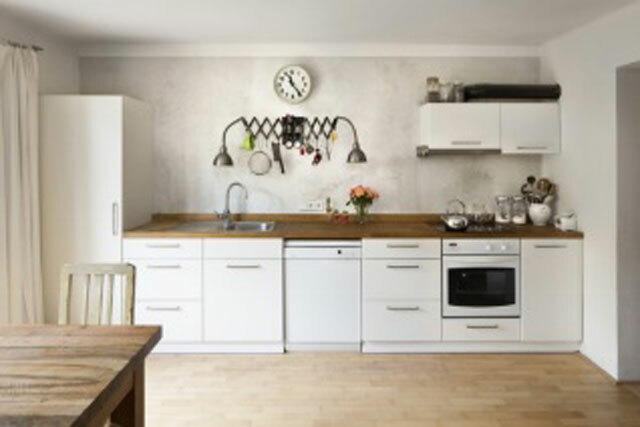 If you don’t want to change your old, unwanted appliances that much, you can still do things to hide their appearance and add features you might need and use. For example, on any of your appliances that lack glass fronts (like your refrigerator or dishwasher) you might hang a whiteboard, a corkboard or even a pegboard, where you can make notes, post important documents or gain additional storage for kitchen utensils. 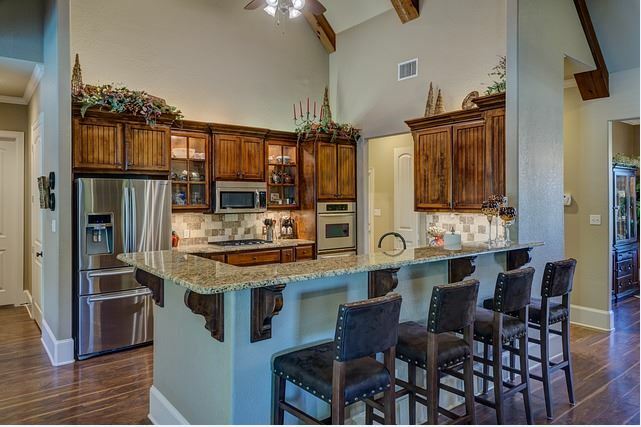 How your kitchen looks is only limited by your imagination. There are solutions for updating your appliances at every price point, so you should start thinking about how you want your kitchen to look and take steps to accomplish it today. On a budget but have expensive taste? No matter which way you look at it, luxury interior design doesn’t come cheap. But if you’re clever about how you spend your money, you can create a modern designer look for less. Here are our top affordable decorating ideas to make your home more stylish. Buying furniture and whitegoods can easily and quickly destroy your budget. If you’re needing to purchase expensive items, cutting out the middleman can be a great way to save on costs. Consider buying furniture online rather than direct in a showroom. You can also pick up a bargain for homewares through auctions or second-hand stores if you do your research. A well-decorated modern home styled on a budget focuses on one or two pieces in each room. This could be a piece of furniture, a framed artwork or a dramatic light fitting. 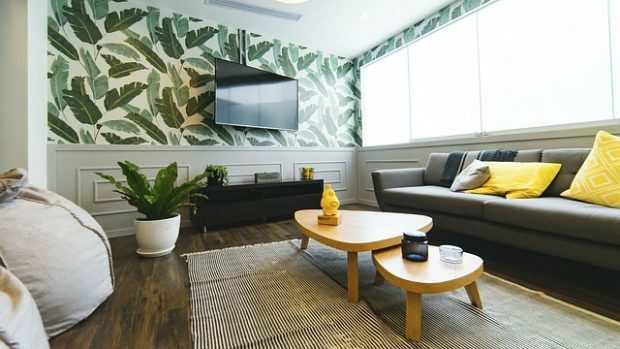 Your interior will look more stylish and of greater quality if you invest in a couple showstoppers rather than a whole heap for cheap furnishings. Paint can instantly transform your interior making it look fresh and new again. If your room is looking a little dull, get your roller out and give your walls a couple of coats of paint. It’s not just walls that can benefit from a lick of paint though. Bathroom tiles, kitchen cupboards or furniture can be instantly renewed and given the designer treatment with paint. Accessories like cushions, throws and rugs are one of the most affordable ways you can create a luxury look for less. It’s also a great way to introduce colour or pattern into your interior without committing to an expensive style. Consider layering your interior with different materials and textures to add a sense of warmth and interest. You can also update your accessories seasonally to keep your interior looking fresh. An entire kitchen or bathroom re-do is a big investment. If you don’t have the cash and it’s in relatively good shape, you can easily update the look of your space by replacing dated hardware and fittings. 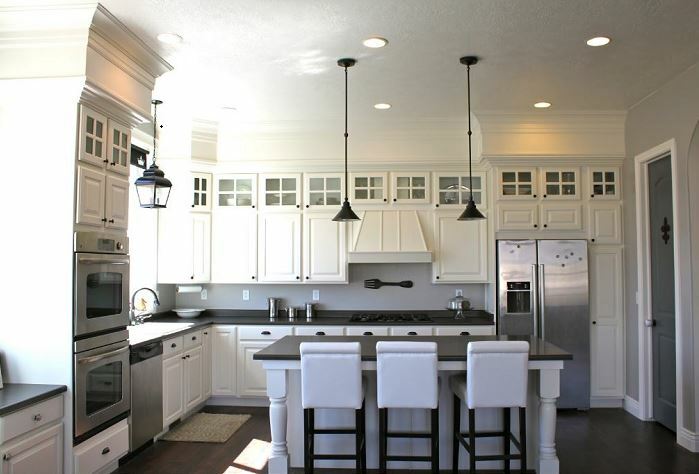 Bring your kitchen into the modern century by changing the door knobs and handles. 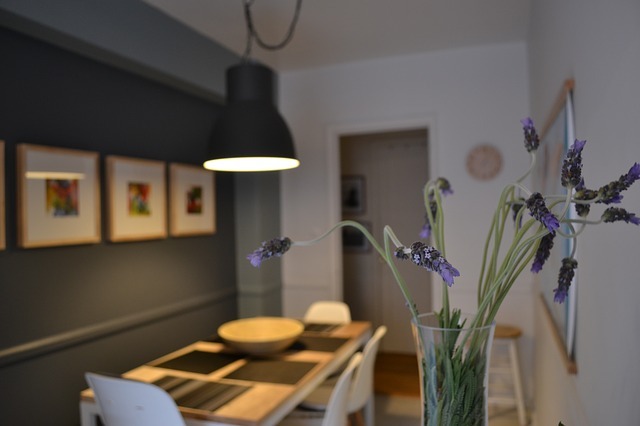 Updating your tableware or light fittings can also transform the look of the space. Decorating your walls is a quick way to give your space a stylish look, and it doesn’t need to cost a fortune. All you need to do is get a little creative! Purchase large scale prints online and pick up some frame from your local homewares store. 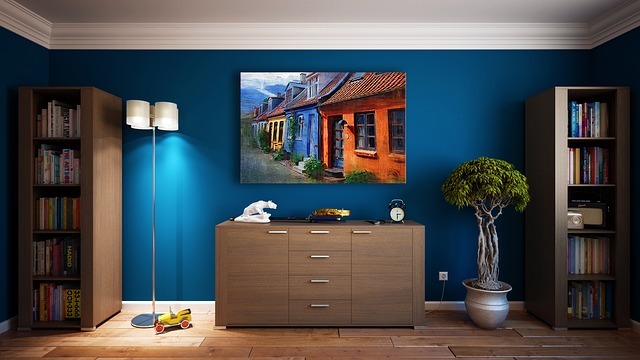 Have some of your travel photos printed and great a gallery wall. Or purchase a blank canvas and create your own signature artwork for your home. Don’t rely on your overhead lighting to create a stylish interior. Consider purchasing a showpiece light fitting or a couple of lamps to enhance the mood and atmosphere of your space. 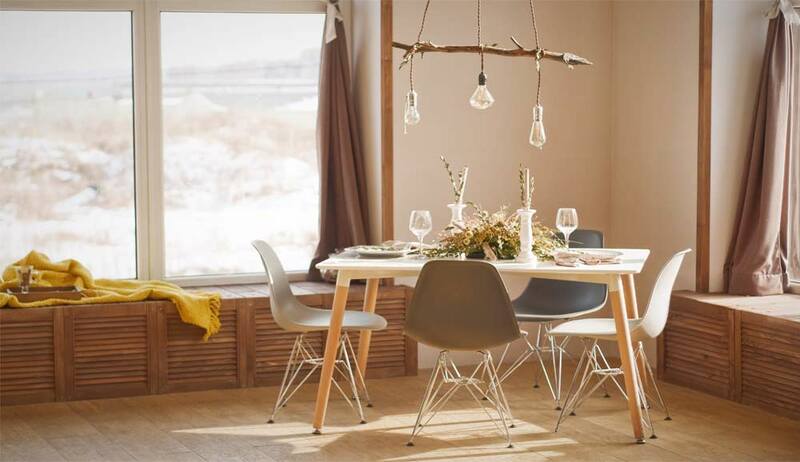 An oversized pendant hung low over your dining table can create intimacy. Table lamps in your living room are not only effective at lighting the space, they can also add interest when their switched off. If your budget is tight, shop online or head to second-hand stores to find your perfect fitting. You don’t have to spend a fortune to create a stylish interior you’ll love coming home to. You just need to prioritise where you spend your cash and think outside the box. Kitchen is the central place of your home where you spend quality time of your day, so why not make it more modern, glamorous and inviting. Adding glass kitchen cabinets renders that wow factor to the cooking space you have always dreamed of. They allow you to display your expensive china, while saving you the hassle of searching every cabinet to find a crucial piece of tableware. 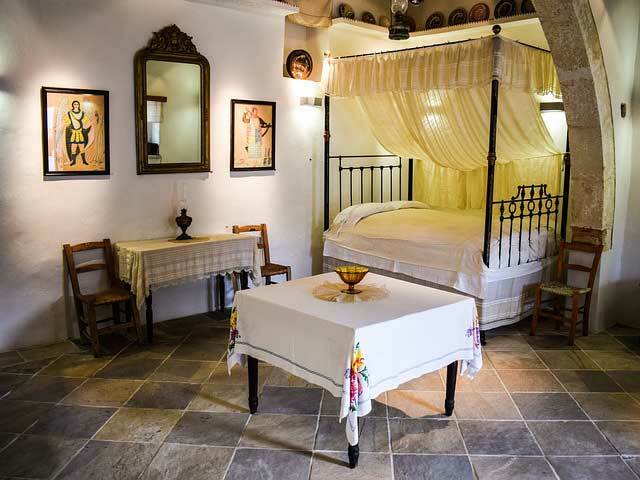 They also make the room appear more spacious and artful. Adding glass cabinets does not mean you have to replace the old ones. 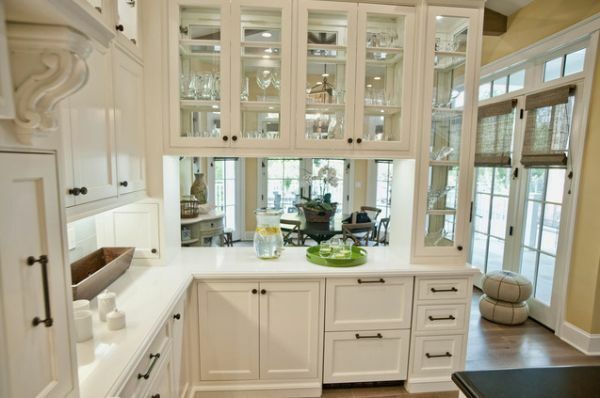 Redesign your existing shelves into glamorous glass cabinets by inserting glass doors. When adding glass to your cabinets, take into account the following two things. First is the type of glass you need to use; each glass serves a different purpose. From clear and translucent to opaque, textured, grooved glass look, the market teems with all sorts of designs to complement your kitchen cabinet style. Clear glass kitchen cabinets show off items inside making them inappropriate for cereal boxes, canned products and other less attractive items you want to hide. They are perfect for showcasing expensive and delicate china, wine glasses and champagne flutes etc. Frosted glass kitchen cabinets are suitable if you don’t want to highlight the items. They not conceal the stuff inside the cabinets to a large extent, but also give a glamorous look to the door. Textured glass cabinets paired with cool marble surfaces add visual texture to your kitchen and make every day dishes standout like display pieces. 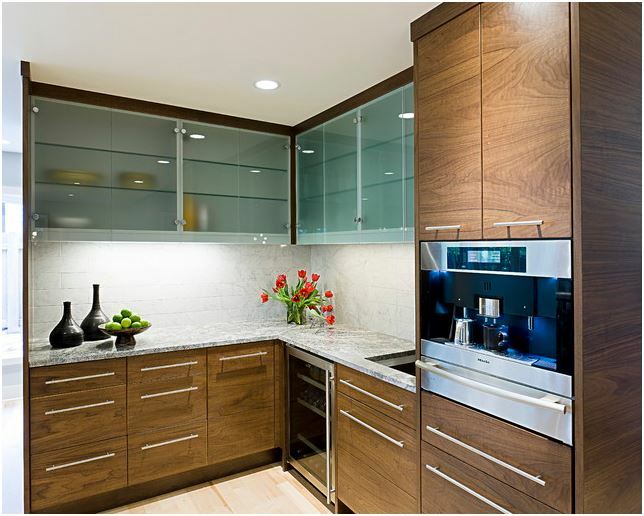 Second factor to be considered when introducing glass cabinets to your kitchen is the location. If you have kids in the house, it’s better not to add glass doors on lower cabinets. 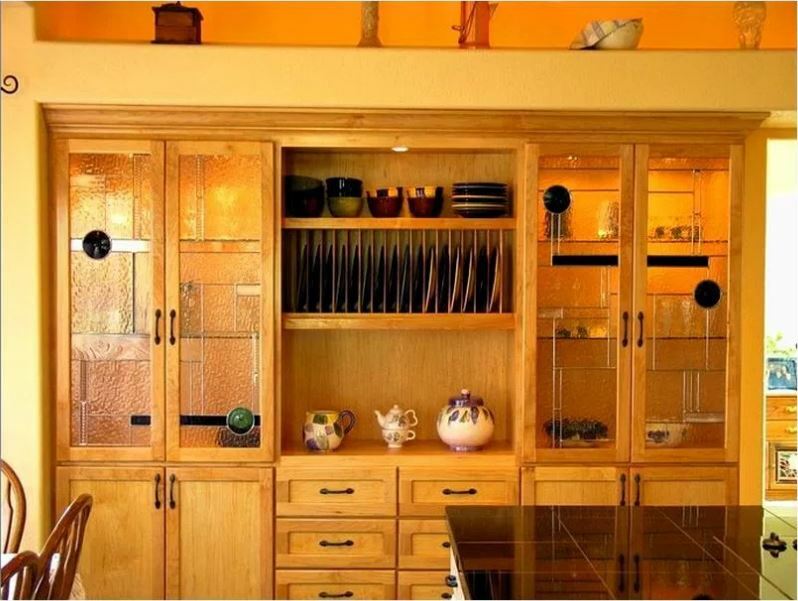 Now let’s discover the various options that will assist you in choosing the right glass door cabinets for your kitchen. There are different types of ornamental glasses available in the market. These include ribbed glass, glass with air pockets to create a textured look, frosted glass and etched glass etc. 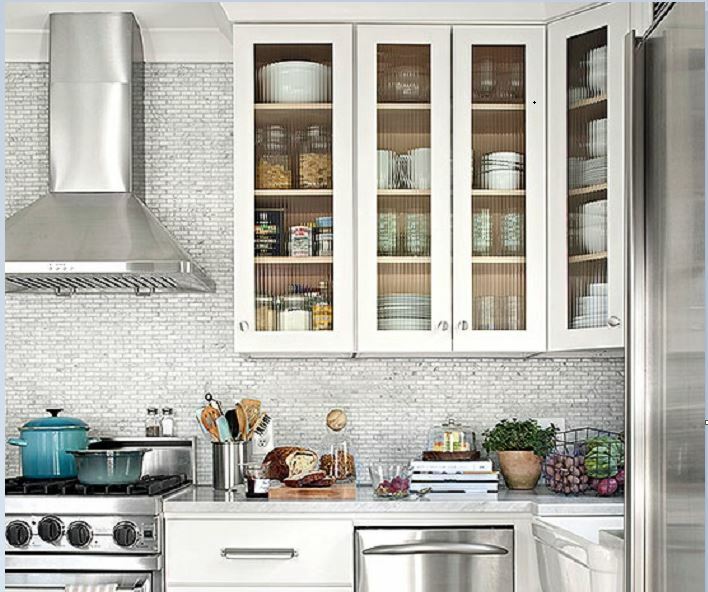 Decorative glass cabinets not only display all flatware and china, but also add visual texture to the kitchen. Frameless glass front cabinets have a whole front sheet of glass for the entire cabinet with decorative hinges. The lack of hardware gives an airy and light feel to the kitchen. For those who love a trace of color in their kitchen, these glass front cabinets with a hint of mint at the back are a perfect option. Adding a little color to your kitchen makes it appear more alive. You can also add other colors that go with your kitchen scheme. Two sheets of sliding glass drilled in hardware or finger-pull cut through the glass slide back and forth on a recessed track. More popular in the 70’s, it is back in fashion again. 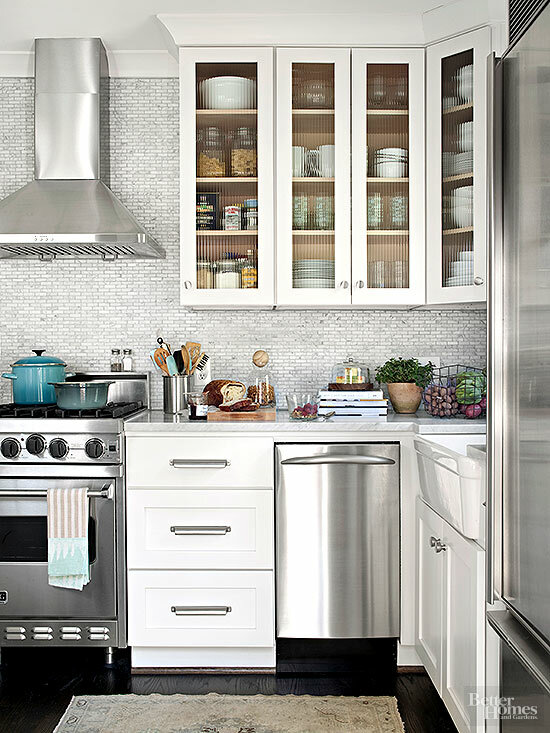 Glass cabinets are the perfect solution for a compact kitchen. While the wood makes the kitchen look solid and crowded, glass adds an entirely different feel by making it appear airy and spacious in addition to giving it a touch of sparkle. 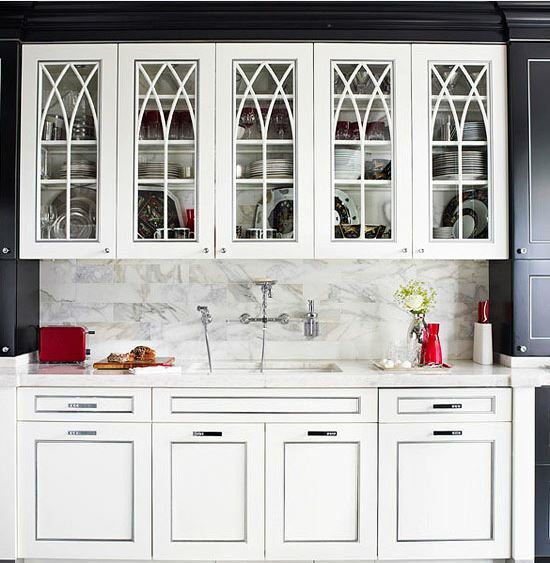 Stained glass cabinets provide a customized look to your kitchen. Use stained glass door cabinets with interior cabinet lighting to enhance the look of the glass. The warm glow of the light through the stained glass will add a hint of gloss to the kitchen. These are ideal for people who don’t have small kids or canines in their homes. 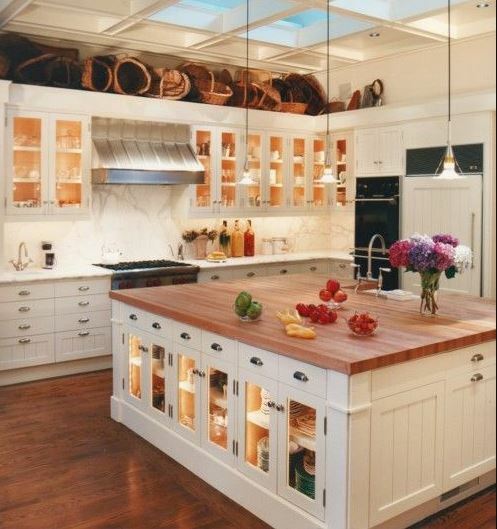 Though not very practical, glass cabinets look beautiful on the floor giving your kitchen a distinctive appearance. Painted glass cabinet doors are frameless with back-painted glass to offer a wonderful glossy look to the kitchen. Peninsula cabinets are found in areas that divide the cooking space and an adjacent space like the dining room. 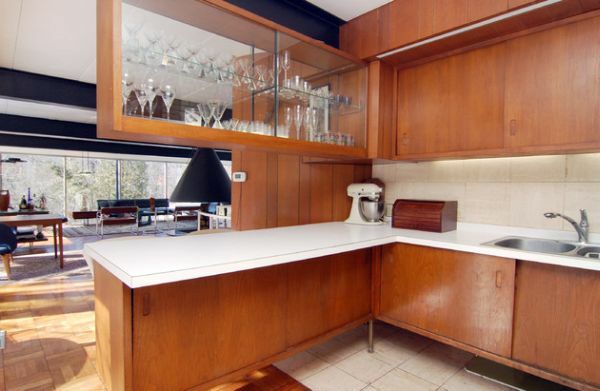 They are accessible on three sides and adding glass-front peninsula cabinets to the kitchen give it a more open feeling. Muntins are timber or metal moldings that hold individual frames of glass or serve for decorative purposes over an entire sheet of glass. They work well to enhance the look of your glass kitchen cabinets, thereby combining style with functionality. 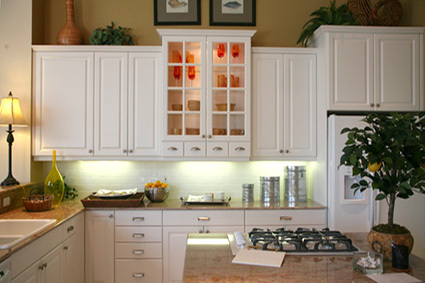 Install interior cabinet lighting to highlight your collections of silverware and dinner sets of crystal and porcelain. The lights will not only augment everything on display, but would also add extra sparkle to the glass doors. 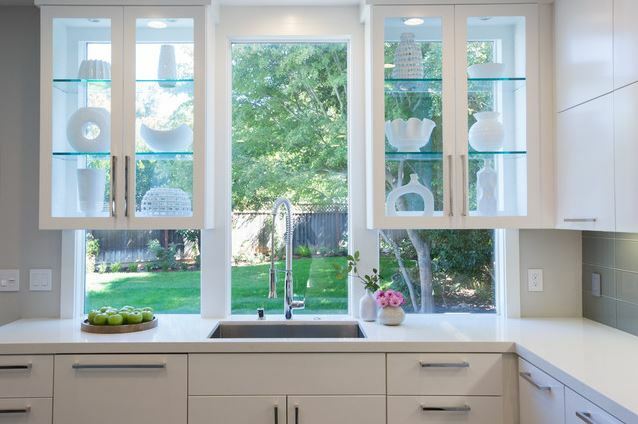 For kitchens with more windows and less wall space, picture window glass cabinets are ideal. You place the glass cabinet on top of the window with no rear panel for the cabinet. It not only brings more sunlight into the kitchen, but also beauty the backyard. Also, make sure the window geometry aligns with the cabinet design. 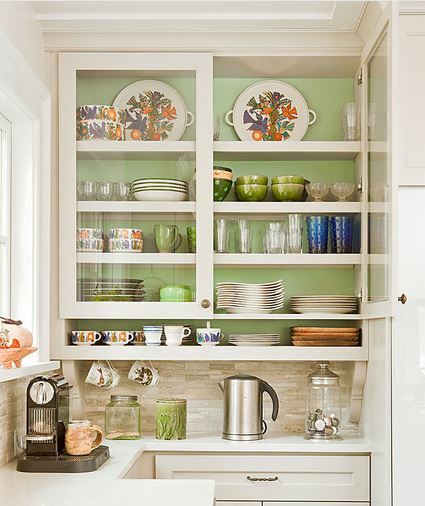 Adding glass cabinets above the upper kitchen cabinets allow you to exhibit your beloved items. Moreover, it gives you the opportunity to utilize the usually wasted space of your kitchen. 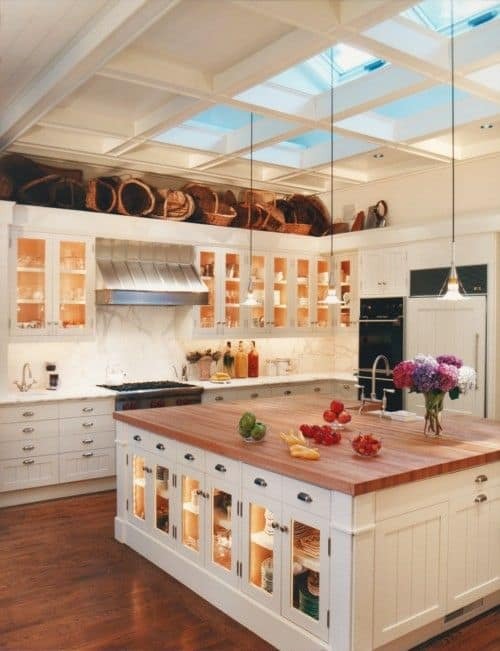 To break the heaviness of all the wooden cabinetry going all the way up to the ceiling, we can use a few glass cabinets. The glass will add glamour to the kitchen, break the monotony and give a feeling of openness. 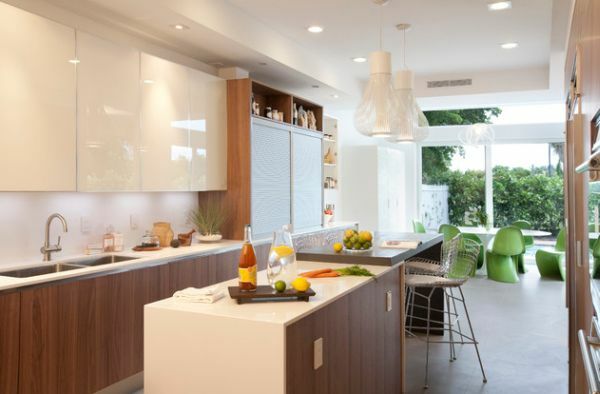 To transform your kitchen into an exciting cooking space, here are some more kitchen design ideas. Why Staging Home is important? One of the biggest mistakes home sellers make is not prepping the house before buyers see it to give it that clean and minimal, but appealing, look. From big overhauls to small details, staging home is a strategy that will bring your Return on Investment of time and money. A well staged home will generate more interest and even 3-5% better offers. The Real Estate Staging Association studied sales and found that staged homes sold 79% faster. Some may worry that a staged house looks impersonal, like a waiting room, instead of home-like. Staging doesn’t have to be cold, but less is definitely more when you show a house. 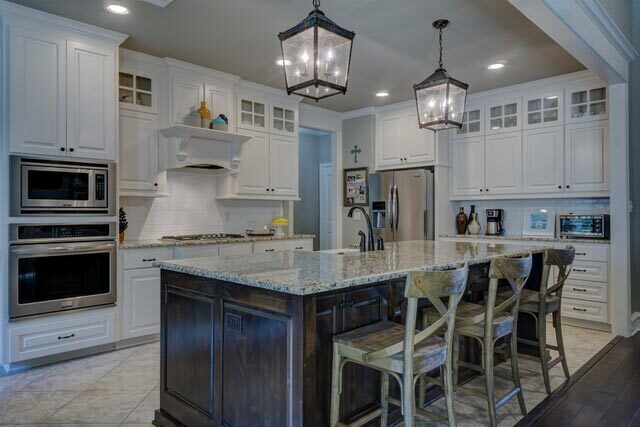 Staging illuminates the house’s features, not your style. Buyers want to see spaciousness, storage, light, and character. Staging lets buyers imagine their life in the house, instead of seeing yours. That’s why effective staging presents an almost-blank canvas, with just the right amount of visual appeal and cues for the imagination. Here are 5 projects that make a difference. No list of tips can overemphasize their importance. No matter what, these two are must-dos. Declutter: All your stuff will distract buyers from seeing the house itself. No piles of magazines, no hundred family photos, no line-up of cereal boxes on the counter, no closets jammed to overflowing. You want the house, not you, in the foreground. Clean: Really, really clean. Wash the walls and the blinds. Scrub grout with an old toothbrush. Dust, sweep, and mop everything. Polish windows, mirrors, and fixtures. Make everything sparkle. And don’t forget smells. You may love your cooking and pets, but their aromas need to be aired out. 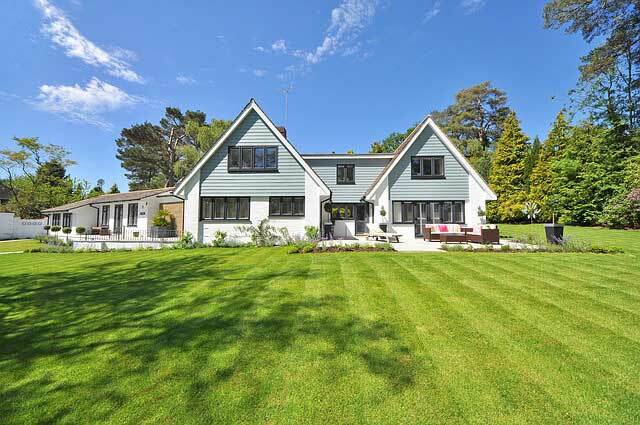 Reseed the lawn and give “curb appeal” some attention. 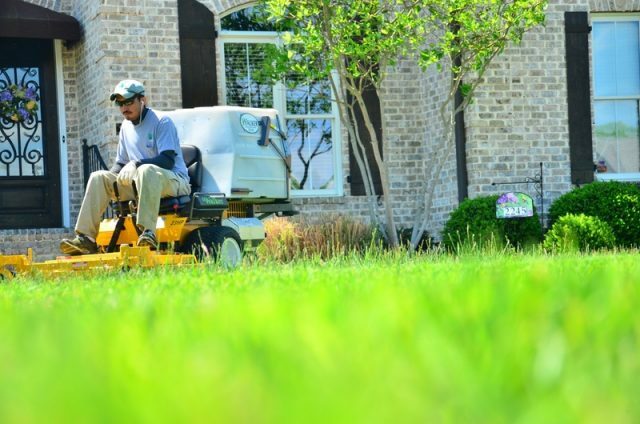 A lush lawn is a guaranteed ROI, as in a 300% return! It’s a big, beautiful part of your home’s first impression and suggests a house that’s been cared for. Also, trim bushes, plant some colorful native flowers, or place some pretty potted plants by the front door. Go beige (or white). Walls in a fresh, neutral color are the foundation of good staging. It’s not the time to be trendy, and certainly not the time to leave that bedroom purple. Beige and white continue to be the go-to colors over time: neutral without being glum. No need to be boring! There are many subtly interesting shades out there. Organize furniture and accent pieces to create vignettes. The right pops of color and personality are perfect final touches. In the kitchen, try glass jars of citrus or seasonal fruits/veggies. Leave a nice pot and cup of tea on the counter for that lived-in feeling, with charm and without Cap’n Crunch. A container of flowers adds fresh color anywhere. If you have blossoms or branches from the yard, you can remind buyers of the property’s landscaping. A few throw pillows also add colorful touches. Coffee table books, neatly arranged on a table or shelf, add personality, and also give you a chance to say something. Books on gardening or local history can emphasize special things about your house or location. You can stage your home yourself, but throw a professional stager into the mix for added wealth of experience. Working within your budget, stagers can edit and arrange what you have or bring in just the right decor. They can handle one room or a whole house with the skill that makes buyers take notice. As Sacramento real estate agent Elizabeth Weintraub says, “Home staging is… the art of creating moods. Professional stagers are highly skilled artists.” Stagers cost about 1% of the list price and are well worth hiring if you’re feeling unsure or overwhelmed by your staging needs. No one would think about attending a job interview or walking the red carpet at the Oscars without looking their absolute best. Do the same for your house through staging: this is your home’s chance to stand out from the competition and shine. If you live with roommates or a partner or spouse, rather than alone, you understand that coordinating space in the shared bathroom can sometimes be tricky. You have to tell people when you shower, or you may have to wait to shower, you need to take turns brushing your teeth, you need separate places for towels and shampoo, and so forth. One thing that can help are vanities with sinks for two. This way you can both use sinks at the same time, for brushing teeth, putting on makeup, grooming, and looking in the mirror. There are other tricks too. For example, you can coordinate regular shower times, or even better if one of you showers in the morning and one in the evening. You can get separate hooks for towels, and a hanger for the shower head to store toiletries. A bathroom vanity with extra storage space will allow you and your partner or roommate to have ample space for both of your things, and double vanities usually have this extra essential space. Having plenty of your own space can ease tension and lend itself to cooperation. While intimacy and friendship are very important, so is time and space to yourself. Be sure to schedule both time together and time apart. You can take walks, read books, or pick up a hobby such as gardening with your dog. This can help to clear your mind and lead to good communication. Keep your space clean and tidy, too. 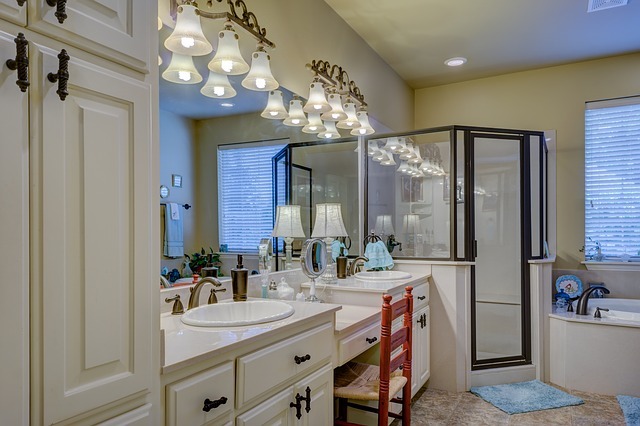 A clean bathroom is not only visually appealing but also more pleasant to be in. With extra foot traffic, it can be all too easy to allow the space to become cluttered or unclean. Perhaps you’d like to set up a chore chart or divvy up cleaning responsibilities for different rooms to different people. For example, if one of you doesn’t like cleaning the kitchen but the other one does, and the same for the bathroom, you could split the rooms that way. Now that you have extra space, you can spend time together watching TV, playing board games, and doing other forms of recreation! You can feel good about the space you live in and feel that there is enough room for the both or all of you. Having enough space will improve the quality of your time together. 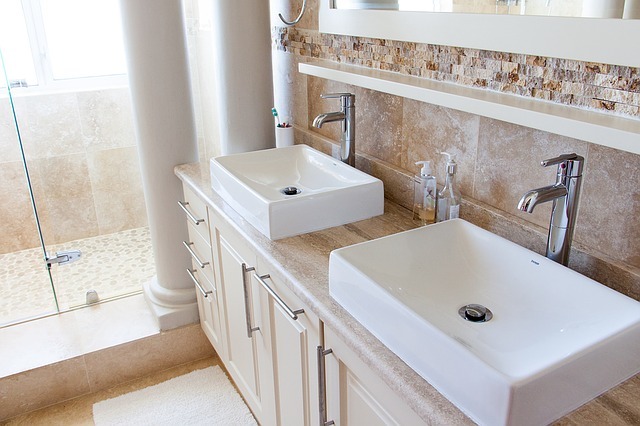 If your bathroom is large enough for a vanity with two sinks, you might want to consider getting one. They add a luxurious and spacious look to any bathroom, and come in all kinds of styles. Whether you are looking for something contemporary, more traditional, or even rustic, you have a wide range of choices. 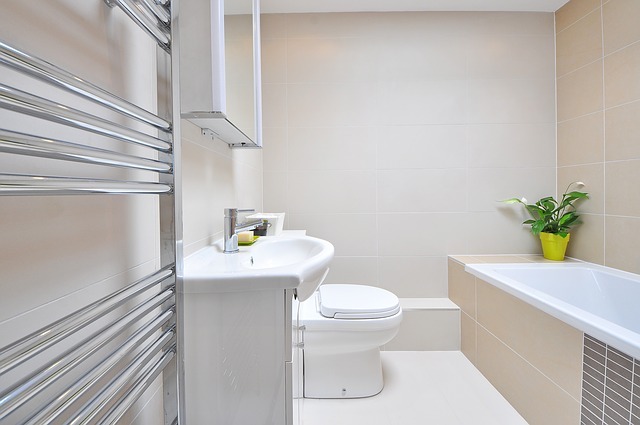 The bathroom does not have to be a place of conflict, contention, annoyance, or frustration. You can get ready for the day and night side by side with plenty of space to change your jewelry, wash your hands, brush your teeth, dry your hair, and so forth.